Hang with us and learn more. Introducing an ingenious new way to simplify your laundry room routine. It’s called Hanger Station. 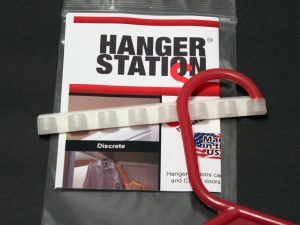 Just install one or more Hanger Stations atop a door frame and suddenly, you have a secure spot to hang your garments that are on hangers. You can actually forget about them falling down as they so often do when you’ve tried hooking a hanger onto that door frame. When you brush past them, down they come. 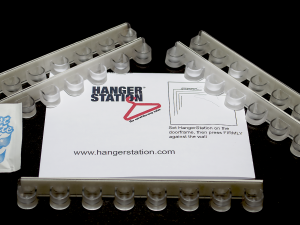 But that won’t happen with Hanger Station because it has deep cups specifically designed for holding hangers.